Saint West is following in his parents' well-dressed footsteps. | HELLO! His sister is one of the best dressed celebrity youngsters, and it looks like Saint West is already giving North a run for her money. Kim Kardashian and Kanye West's son, who was born in December, made an appearance on Snapchat at the weekend as the family celebrated Easter. Kim, 35, and 38-year-old Kanye have kept their baby boy out of the spotlight, sharing only a couple of pictures of him since his birth. 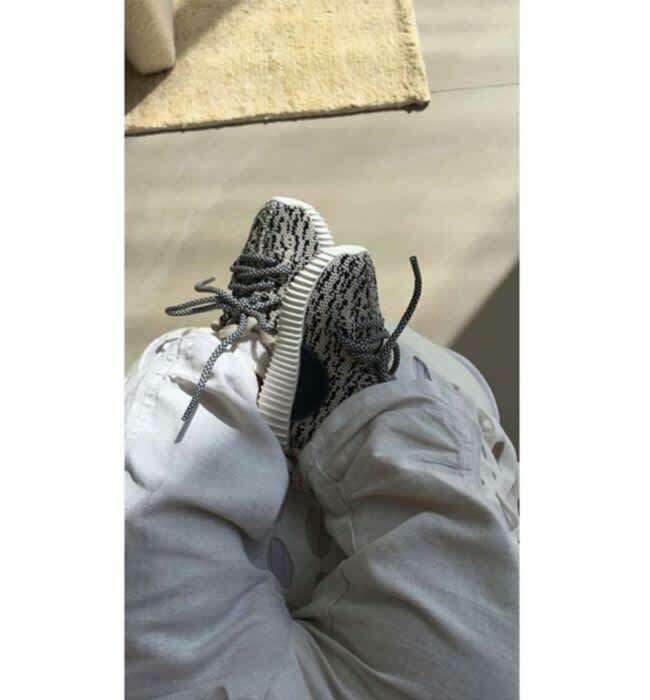 But the reality TV superstar couldn't resist showing off his latest pair of trainers; exclusive infant-sized YEEZY Boost 350. The adorable shoes are not currently available to the public, but Saint, two-year-old North and their cousins have been lucky enough to get their hands on some. Rapper Kanye, 38, recently confirmed he is working on a children's collection, which will be out later this year, so it won't be long until you can have the baby in your life channelling the Wests. Kim introduced Saint via Instagram in February, and gave her followers another peek at him again earlier this month. Alongside the snap, she wrote: "You're the sun in my morning babe." Meanwhile Kanye had his own, slightly less cool, Easter outfit. He was snapped dressed in a bunny outfit, complete with floppy, white ears. He and Tyga, 25, dressed up to entertain the children during the weekend's festivities – with Kim and sister Kourtney, 36, only too happy to post the moment for all of their fans to share. Kanye and Tyga posed for pictures with Kourtney and her children Mason, five, Penelope, three, and one-year-old Reign Aston. But it appeared Nori didn't want to share her dad, as she held on tightly to his paw. This is NOT Kim Kardashian!